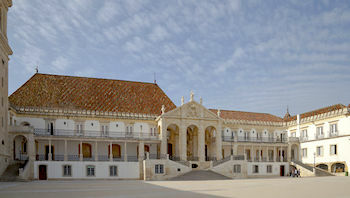 On 11 March 2016, the European Physical Society [EPS] and the Portuguese Physical Society [SPF], honoured the “Cabinet of Physics of the University of Coimbra”, in the building of the oldest Jesuit college in the world (founded in 1542) donated by the Marquis of Pombal to the University of Coimbra. This College is important to the History of Physics, due to the University reform implemented during the Enlightenment by the Portuguese Prime Minister the Marquis de Pombal (1699-1782). During this time, the Jesuits were expelled. In their place, the Faculties of Philosophy and Mathematics were created, devoted to the development of the emerging Newtonian science. The notoriety of the “Old Cabinet” comes also from the uniqueness and extraordinary state of preservation of its fantastic collection of didactic and scientific instruments of the 18th and 19th centuries, remarkably reflecting the evolution of Physics in those two centuries. The instruments were designed and crafted in the best British and German workshops at the time, and combine in an uncommon way, scientific exploration and communication with artistic expression. The historic site ceremony, organised by Carlota Simões, Director of the Science Museum of the University of Coimbra, took place in the renovated amphitheatre room, exhibiting the original shelves, table and chairs, where the Italian physics professor Giovanni Dalla Bella (1730-1823), hired by the Marquis de Pombal, delivered his classes. The hiring of Dalla Bella is another indication of the international worldview of the Marquis. The EPS historic site plaque was unveiled simultaneously by Luisa Cifarelli, representing the EPS, and the Rector of the University of Coimbra, João Gabriel Silva. The welcome addresses included an introduction to the history of the site by the scientific consultant of the collection Décio Martins Ruivo (who drafted the proposal to the EPS with Carlos Fiolhais) and a note on the Physics Department of the University of Coimbra by its Director José António Paixão. The President of SPF, Teresa Peña, highlighted that the organisation in 2014 of the proposal leading to this distinction was thought to mark the launching of the History of Physics Group in the Portuguese Physical Society, and to shed some international light on Portuguese science, during the somewhat troubled times of the austerity crisis. Finally, Luisa Cifarelli underlined the precious cultural and scientific value of the site. The Rector of the University of Coimbra closed the addresses by mentioning the relevance of this legacy for the University of Coimbra, linking the past to the modern science and research developed at the Science Departments of the University. (...) its fantastic collection of didactic and scientific instruments of the 18th and 19th centuries, remarkably reflecting the evolution of Physics in those two centuries.”.